To establish a new convent rule you have to have the Pope´s approval, so that was why Birgitta went to Rome in 1349. The Pope lived during this time not in Rome but in Avignon in France. Birgitta worked hard to get the Pope to move back to Rome and make her new convent rule accepted. Not until 1370 the Pope Urban V accepted the Brigetin rule, the rule of Our Holy Saviour, an abbey for both monks and nuns with a common church and different dwelling-houses. Today's abbeys of the Brigetin rule are for nuns only. During the greater part of her years in Rome, Birgitta lived in a house at Piazza Farnese. After her death, it was given to the abbey of Vadstena, that rebuilt it into a shelter for Swedish pilgrims. The house has been accessible ever since 1931 for the Birgitta sisters who actually manage a guesthouse there. Birgitta made a pilgrimage to Jerusalem together with her two children Birger and Katarina the years 1372-73 AD. Unfortunately, she died in her home at Piazza Farnese in 1373, when she came back to Rome. 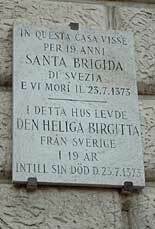 A sign announces that Saint Birgitta has lived in the house.